We Photoshop users (or Adobe Creative Suite users in general) come to rely on our keyboard shortcuts. They become so engrained that it can be quite disconcerting when one or more of these keyboard shortcuts inexplicably stops working or begins to do something completely different. And it can be downright exasperating if you can’t figure out what’s going on. This has recently happened to me, twice, so perhaps I can help. Adobe and other software developers know that experienced users want keyboard shortcuts to improve their productivity. After some practice with keyboard shortcuts, especially the ones involving the “modifier” keys (Ctrl/Cmd, Alt/Option and Shift), the user can learn to “play” the application like a musical instrumentleft hand on the modifier keys, right hand on the tablet. So it can feel like having one arm tied behind your back when one of your favourite keyboard shortcuts stops working or begins doing something completely different. This has recently happened twice for me. The first case involved the Alt + PageDn / Alt + PageUp in InDesign. These are the shortcuts for paging through a document in spreads. As a book designer, this is very useful since books are laid out in spreads (left page, right page). One day, my Alt + PageDn / Alt + PageUp commands just stopped working. I checked the keyboard shortcut preferences and even the definition file to confirm that these shortcuts were still defined. They were. I posted on the Adobe Forums and did the usual “trash preferences”, but no help. I compared my laptop and my desktop and both systems had “lost” these shortcuts. What the heck was going on? I tried reassigning the functions to different key combinations and sure enough, these shortcuts worked. That’s when I decided to install KeyTest, a tool for displaying the actual keycodes generated by the keyboard. What I found was bizarre. All the modifier keys worked fine with PageDn and PageUp except the Alt key. With Alt pressed, PageDn and PageUp did nothing (well, nothing that KeyTest could detect). So I started disabling start-up applications and that’s when I found the culprit. It was Skype! Skype has “hotkeys” and hotkeys can intercept a keycode even before KeyTest can see it. 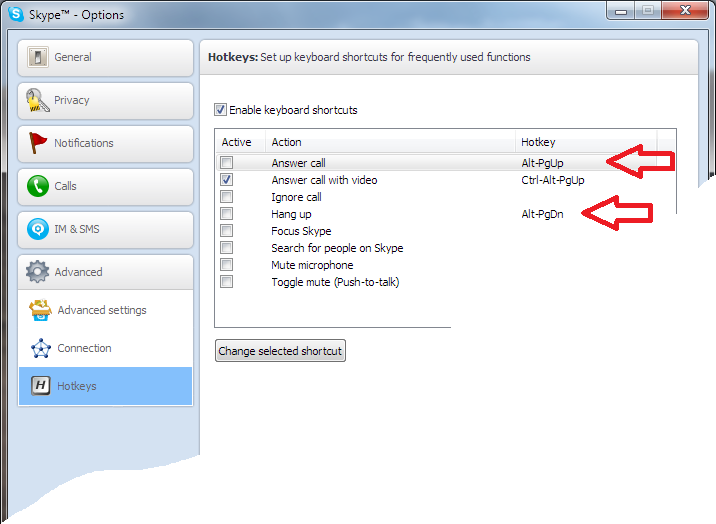 And Skype’s hotkeys for answering and hanging up a call are, you guessed it, Alt + PageUp and Alt + PageDn. So I disabled Skype’s hotkeys and problem solved. That’s when I noticed on my desktop system that my favourite Photoshop shortcut, Ctrl + Alt + I (Image Resize) was misbehaving. It was inverting the colours on my screen! At first, I thought this was just in Photoshop. But I soon discovered that Ctrl + Alt + I was inverting the screen colours across all of Windows. On Macs, there is an OS X keyboard shortcut to do the same thing: Control+Option+Command+8. But I had never seen this on Windows. I decided to test my laptop and damn! it was doing it too! What the heck was going on? Google was no help, but then I realized what was happening. The Mac OS X feature is to help make some apps more readable (inverting black and white for example). I sometimes use a Windows 7 feature to aid in readability, the “Magnifier” which is activated by the Win + Plus hotkey. This handy tool zooms the display to 200% magnification. To get 100% magnification again, press Win + Minus. When the “Magnifier” is zoomed, positioning the mouse cursor near an edge of the screen will pan the screen in that direction. It’s a great way to read fine print in a document or web site. Once activated, the “Magnifier” remains active, ready to respond to your zoom-in, zoom-out keyboard requests. It displays as a transparent magnifying glass on your screen. If you click on the magnifying glass, a tiny window appears with some additional options. And what I discovered is that the “Magnifier” implements another feature. Yes, that’s right, the “Magnifier” inverts the screen colours with Ctrl + Alt + I. When the “Magnifier” is active, this hotkey overrides Photoshop (and presumably all other applications). So by closing the “Magnifier”, Ctrl + Alt + I resumed its familiar function in Photoshop and my problem was solved…again…for now. With so many keyboard shortcuts defined in the Adobe Creative Suite, it is highly probable that any hotkey in the system will conflict with one of them. So if your keyboard shortcuts are misbehaving, you should at least consider the possibility that a hotkey is to blame. PreviousPrevious post:Photoshop User TV Celebrates 300th EpisodeNextNext post:The world changes again!